"I Wouldn't Hesitate To Recommend"
Mrs J visited our showroom after struggling to find the right material from local sources. At our production facility & showrooms, Mrs J was able to experience the largest selection of Natural Granite & Quartz in South Wales. We pride our selves, not only on our 75 years of trade experience, but also on our customer satisfaction and professionalism. To experience this for yourself, please contact us today and discuss your plans with us. Mr & Mrs L had been recommended to us by family of theirs. After a visit to our showroom and a tour of our production facility, the couple narrowed down their choices to just 2 colours. After taking a sample home to compare in their kitchen, they called back that week and reserved their material. Mr & Mrs L where able to view over 700 slabs of Natural Granite display here at our production facility. As well as our two floor showroom displaying a multitude of materials and colours, they also had over 4 manufacturers of Quartz to chose from and different ranges of Sintered Compact Surfaces. Take a look at their ‘Comment Card’. Just like Mr & Mrs L, we ensure that all of our customers have a fault free service from us. 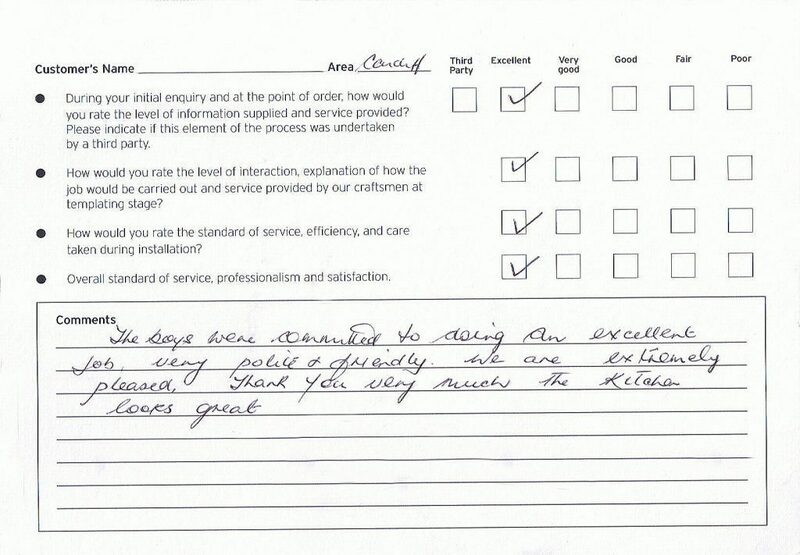 Ensuring customer satisfaction is our number one priority. "Committed to Doing An Excellent Job!" Mr C had a very modern kitchen bringing a fresh look to his property in Cardiff. Looking for the perfect surface to compliment the kitchen, Mr C had found a 20mm Quartz that helped bounce light into the room. After our installation had been completed, Mr C sent us this feedback card. 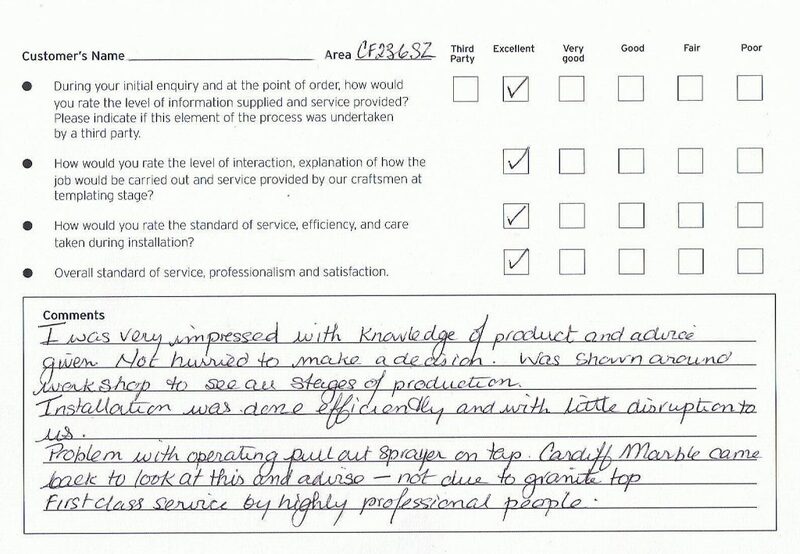 "Very Impressed By Their Dedication"
Mrs T came to visit our showroom a few months back. Struggling to find the right colours to go with her kitchen, Mrs T was able to use one of our 'Sample' cabinet doors whilst browsing through the large selection materials. Being able to take the door and view next to a whole slab of Natural Granite really helped Mrs T with her decision. Colonial Cream was the perfect match. It looked truly stunning. 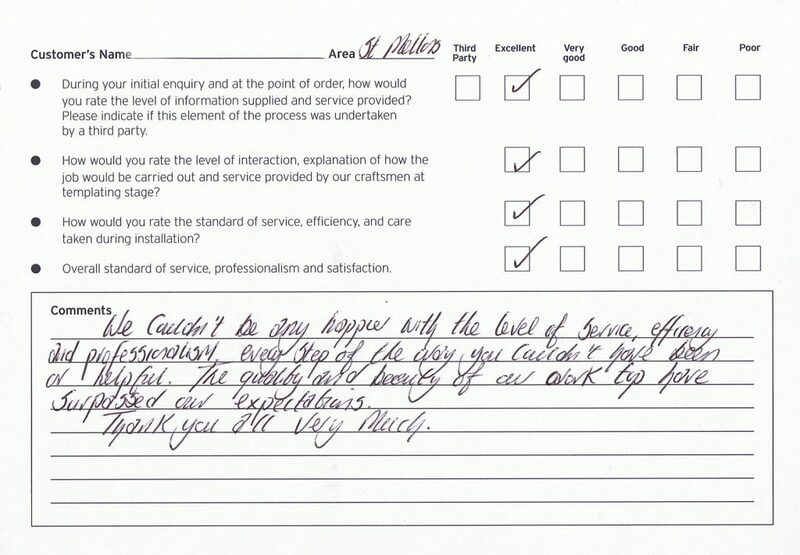 "Very professional service from beginning to end. Very polite and courteous workmen, very impressed by their dedication, punctuality and quality of work. Would highly recommend." "The Finished Product Is Stunning"
Mr H came to us in search of the perfect material for his new kitchen. With this being the first time the customer was having Granite in his home, we took the opportunity to explain to Mr H all about the material and how we fabricate it. After searching through different suppliers, Mr H felt as though we were the company for him. "The Most Important issue I have in any aspect of house renovation is to have confidence in the product and installer. From initial query to installation, everything was handed in a polite, courteous and professional manner. All questions were answered and I was updated when required. The finished protect is stunning and I will have no hesitation in recommending Cardiff Marble to any prospective customers. With Thanks." "So Good We Returned The Very Next Morning To Order More"
A challenging design with ambitious results. Mr & Mrs P came to us with a very unique design. Influenced from American style, unique shaped, joints and overhangs. No task to large for us here at Cardiff Marble. Mr & Mrs P where so impressed with the finished result they came back the very next day to order more! 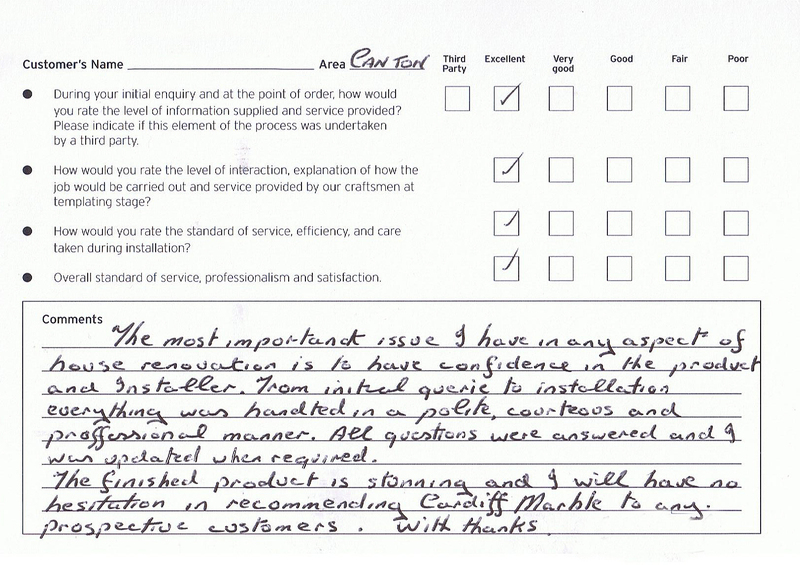 “The standard of service, professionalism and satisfaction was so good that we returned to Cardiff Marble the very next morning to order some more. 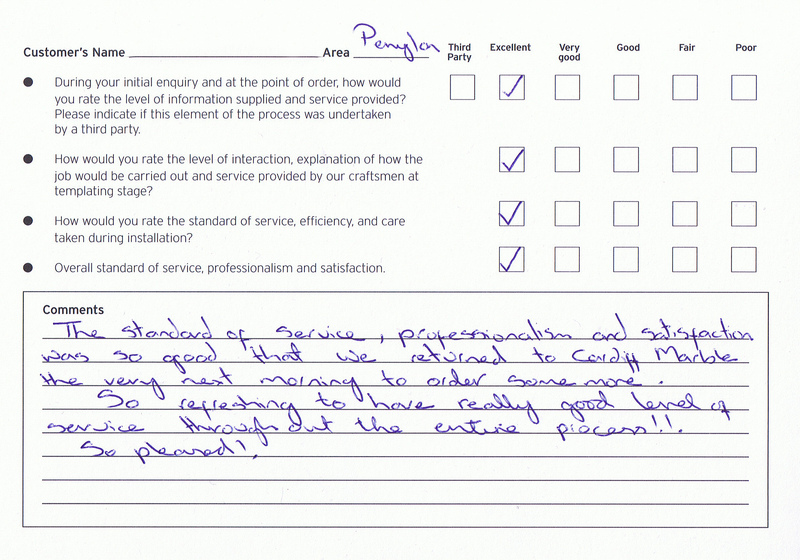 So refreshing to have a really good level of service throughout the entire process. "The Quality & Beauty Has Surpassed Our Expectations!" Mr & Mrs E was extremely happy with their surfaces. They visited us 12 months before their installation, at this point just browsing our selection of Granite. After viewing over 1000 slabs of Natural Stone, Mrs E fell in love with a material she could't let go. 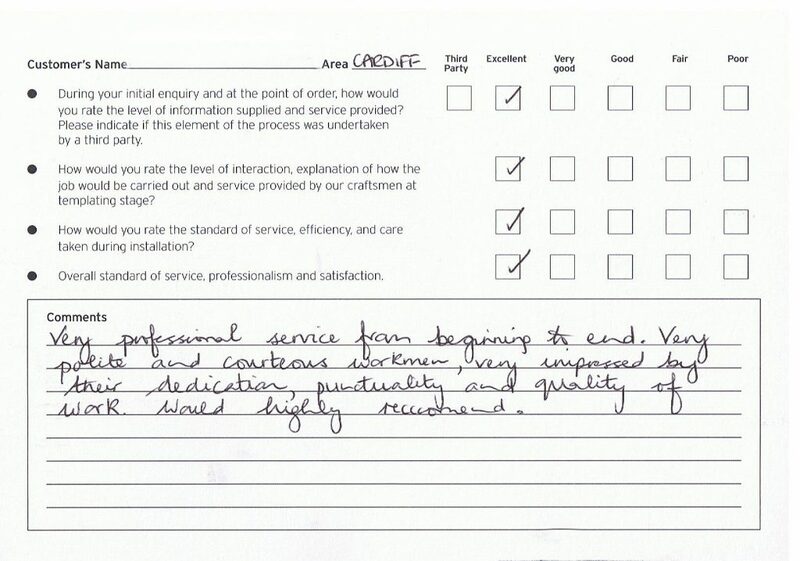 "We couldn't be happier with the level of service, efficiency and professionalism. Every step of the way you couldn't have been more helpful. The quality and beauty of our worktop have surpassed our expectations. Thank you all very much!" Connect With Us On Facebook & Read Our Reviews! Mrs & Mrs L came to us in search of the perfect surface. 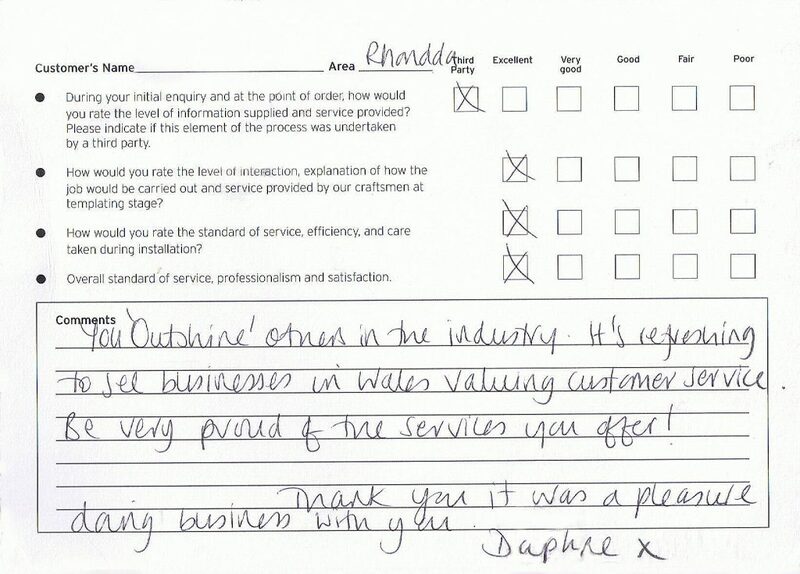 After visiting other companies, she viewed our stock of over 1000 slabs at our production facility in Cardiff. After this, Mrs L was able to see multiple displays over two floors in our showroom, demonstrating how these materials look 'installed' in a kitchen. We worked closely with Mrs L to find her the surface she was dreaming of. The customer was able to pick her exact slab and how she wanted each surface used from it. After finishing the job, here are her comments. Early November we received a visit from Mrs Davies, Senior Laboratory Technician at St. Josephs High School Newport. Mrs Davies was looking for stone materials to use in a geology classroom investigation. We showed Mrs Davies and her colleague around our showroom and production facility, where we explained the process of Granite & Quartz work surfaces. We then provided St. Josephs with a number of different sample materials to be used in their studies. 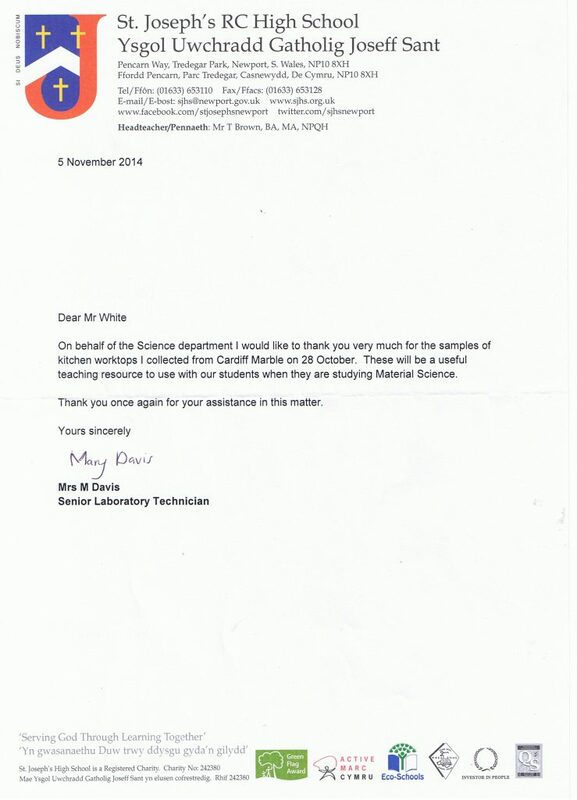 After offering a tour for the students and providing the samples, we received this kind letter from Mrs Davies. 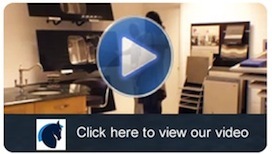 Mr & Mrs G visited our showroom to view the large array of material on display. After a tour of our production and conversations concerning all stages of our process, the couple fell for a beautiful stone called ‘Ivory Chiffon’. This Natural 300 Million year old Granite was the perfect compliment to their kitchen.